Gone are the days when you could easily dismiss architectural speakers are mere "elevator speakers." These days, there are some amazingly high-performance in-walls and in-ceilings that easily go toe-to-toe with some of their best free-standing brethren. And let's face it: the rise of object-based surround systems like Atmos and DTS:X have made architectural speakers an important consideration for all home theater enthusiasts. As such, it's no surprise to see companies like MartinLogan focusing so much effort on refining and improving their already-great in-wall and in-ceiling offerings. The company's latest series, introduced this week at ISE, is a relaunch of its Installer Series line, comprised of everything from itty bitty offerings that mimic the form factor of can lighting, to big, beefy eight-inchers with 45 Hz low frequency extension. The Installer Series by MartinLogan is a line of affordable, high-performance custom installation in-wall and in-ceiling speakers. Manufactured to the highest standards of quality and performance, these products are available through authorized custom installation specialists, are easy to install, and carry the full MartinLogan warranty. Titanium dome tweeters and mineral-filled polypropylene drivers guarantee great performance. Paintable micro-perf, bezel-free grilles are secured with high-strength magnets and provide an aesthetic that blends discreetly into any ceiling or wall. Each model comes with a remarkably robust mounting-lock system that couples the speaker's vibration-resistant ABS chassis firmly to walls and ceilings. The IC3 and IC3-AW in-ceiling speakers feature 3.5-inch woofers and are designed to be the smallest, most powerful and dynamic speaker possible. The sound coming from these petite speakers is vibrant and richly detailed. The mounting-locks on both models are upgraded to die-cast aluminum to maximize strength while allowing a reduction to the physical size of each mounting-lock. A novel woofer surround on the IC3, molded directly onto the speaker's chassis, essentially turns the speaker enclosure into the woofer basket. This solution maximizes woofer size and performance while keeping the speaker extremely small. Carefully hand-built using only the finest polyester capacitors and air-core coils, Installer Series crossovers employ MartinLogan's proprietary Vojtko topology for vanishingly low distortion and seamless driver integration. This precision-tuned network preserves even the most microscopic sonic nuances while handling the full dynamics of any source. Crossover updates offer an enhanced off-axis response, providing an exceptional performance across the entire listening space. Spring-loaded binding posts feature a larger wire access hole and connect via banana plug, pin, or 12AWG bare wire. IW6: In-wall speaker with a 0.75-inch titanium dome tweeter, 6.5-inch mineral-filled poly cone woofer, and a frequency response of 55-20,000Hz. $199.99/each (US retail). A pre-installation bracket is available. IW5-LCR: In-wall speaker with a 0.75-inch titanium dome tweeter, dual 5.5-inch mineral-filled poly cone woofers, and a frequency response of 60-20,000Hz. $299.99/each (US retail). A pre-installation bracket is available. IC8: In-ceiling speaker with a 1-inch titanium dome tweeter, 8-inch mineral-filled poly cone woofer, and a frequency response of 45-20,000Hz. $249.99/each (US retail). A pre-installation bracket and square grille are available. IC6: In-ceiling speaker with a 0.75-inch titanium dome tweeter, 6.5-inch mineral-filled poly cone woofer, and a frequency response of 55-20,000Hz. $199.99/each (US retail). A pre-installation bracket and square grille are available. IC3: In-ceiling speaker with a 0.75-inch titanium dome tweeter, 3.5-inch mineral-filled poly cone woofer, and a frequency response of 100-20,000Hz. $199.99/each (US retail). A pre-installation bracket and square grille are available. IC6-ST: In-ceiling speaker with dual binding posts, dual 0.75-inch titanium dome tweeters, 6.5-inch dual voice coil mineral-filled poly cone woofer, and a frequency response of 52-20,000Hz. Binding posts can also be bridged to deliver mono sound reproduction with wide dispersion. $249.99/each (US retail). A pre-installation bracket and square grille are available. IC6-HT: In-ceiling speaker with a 1-inch titanium dome tweeter, 6.5-inch mineral-filled poly cone woofer, and a frequency response of 55-20,000Hz. Designed with a special baffle, the woofer and tweeter are mounted at a 30° angle allowing them to easily direct sound toward the listening area. $299.99/each (US retail). A pre-installation bracket and square grille are available. 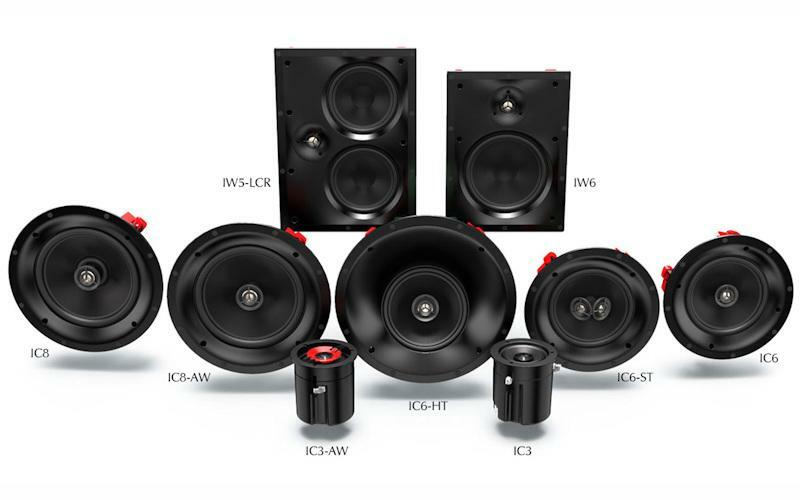 IC8-AW: All-weather in-ceiling speaker, rated to IP54, with a 1-inch titanium dome tweeter, 8-inch mineral-filled poly cone woofer, and a frequency response of 45-20,000Hz. Numerous design considerations make them ideal for outdoor and other high-moisture applications. $349.99/each (US retail). A pre-installation bracket is available. IC3-AW: All-weather in-ceiling speaker, rated to IP54, with a 0.75-inch titanium dome tweeter, 3.5-inch mineral-filled poly cone woofer, and a frequency response of 100-20,000Hz. Numerous design considerations make them ideal for outdoor and other high-moisture applications. $299.99/each (US retail). A pre-installation bracket is available. • Visit the MartinLogan website for more product informtion. • MartinLogan Motion 4i Bookshelf Speaker Reviewed at HomeTheaterReview.com. • MartinLogan Announces Next Generation of Dynamo Subs at HomeTheaterReview.com.